While the donor-bound paradigm (Case 2) minimizes the number of protecting group manipulations that have to be carried out on the solid support, it mandates the presence of a latent glycosyl donor moiety in the solution-based glycosyl acceptor. Glycal building blocks fulfill these requirements, since they serve as glycosyl acceptors but may be converted into powerful glycosylating agents. Danishefsky and coworkers successfully explored the application of the glycal assembly method to the solid support synthesis of oligosaccharides and glycoconjugates . The general principle of the glycal assembly method is outlined in Scheme 2. Attachment of a glycal to a solid support through the nonreducing end results in the presence of a terminal glycal function that may be readily converted into donor 2. Since glycals are employed as the solution-based acceptor, the protecting group scheme used for the identification of hydroxyls predestined for glycosylation remains relatively simple. Scheme 2 Use of the glycal assembly method in a general strategy for the synthesis of oligosaccharides on a solid support. iodonium source . Support-bound 2 acts as a glycosyl donor when treated with a solution of acceptor glycal 3, along with any necessary agents to promote the glycosylation, thereby forming 4. The process can be repeated to assemble the desired oligosaccharide, followed by retrieval from the support and purification by chromatographic methods. All studies on the solid support synthesis of oligosaccharides by the glycal assembly approach employed a polystyrene 1% divinylbenzene copolymer, which is commonly used in solid support peptide synthesis because of its high loading capacity, compatibility with a wide range of reaction conditions, and low price. 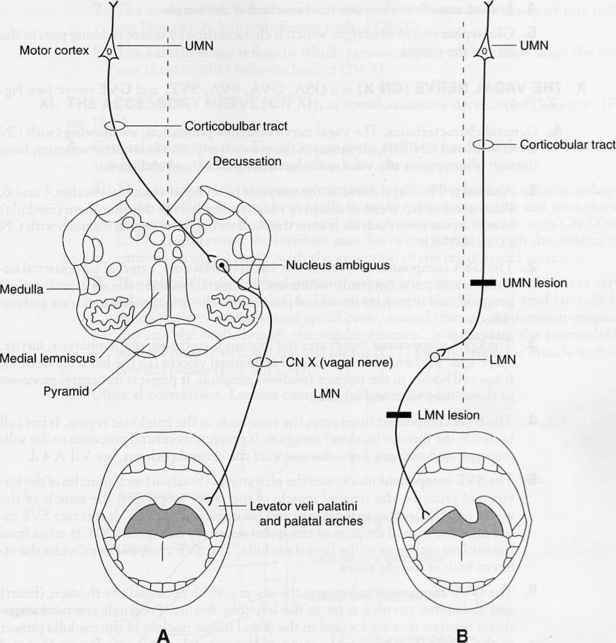 The first glycal was linked to the solid support through a disilane linkage that could be cleaved rapidly and completely by treatment with fluoride . 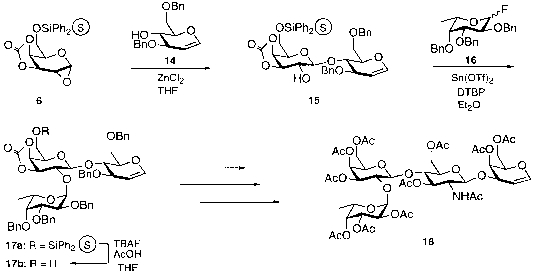 The validity of the approach was first demonstrated by the synthesis of a linear tetrasaccharide  and a hexasaccharide 13  as outlined in Scheme 3. Polymer-bound galactal 5 was converted to the 1,2-anhydro sugar 6 by epoxidation with 3,3-dimethyldioxirane . Polymer-bound 6 acted as a glycosyl donor when reacted with a solution of 7 in the presence of zinc chloride, resulting in the formation of disaccharide 8a. Upon repetition, this glycosylation procedure accommodated the secondary alcohol glycosyl acceptor 10 as well as disaccharide acceptor 12. Fluor-idolysis with tetrabutylammonium fluoride (TBAF) was used to cleave the desired products from the polymeric support and furnish hexasaccharide 13 in 29% overall yield from 5 . Scheme 3 Solid phase synthesis of a hexasaccharide by the glycal assembly method. glycal assembly approach outlined above found its first applications in the synthesis of a H-type 2 tetrasaccharide (Scheme 4) [29,30]. Treatment of polymer-bound 1,2-anhydro sugar 6 with a solution of glucal acceptor 14 provided disaccharide 15. 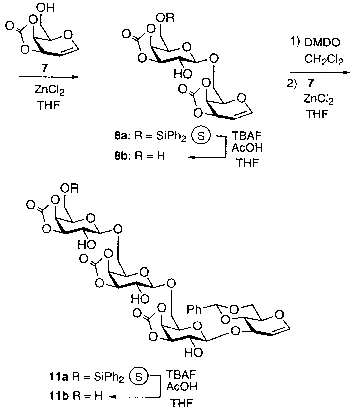 Upon opening of a 1,2-anhydro sugar during glycosylation, a C2 hydroxyl group is exposed, which may in turn serve as a glycosyl acceptor to form branched oligosaccharides . Compound 15 was fucosylated using a solution of fucosyl donor 16  to furnish trisaccharide 17. Treatment of 17a with TBAF provided trisaccharide glycal 17b in 50% overall yield from 5. Because of the lack of solid support methodology to fashion glycosidic linkages bearing C2-acylamino functions, solution phase chemistry had to be employed to access the H-type 2 blood group determinant glycal 18. Ready functionalization at the reducing end was achieved through the terminal glycal handle. The Lewisb blood group antigen (Leb) is of particular interest because it has been identified as a mediator for the binding of Helicobacter pylori to human gastric epithelium . Clinical studies have identified H. pylori as a causative agent in gastric and duodenal ulcers , and antimicrobial treatments are an effective means to combat infection . Since bacterial attachment is a prerequisite for infection , analogs of the Leb oligosaccharide may serve as therapeutic alternatives to broad spectrum antibiotics. Scheme 4 Solid phase synthesis of an H-type blood group determinant by the glycal assembly method. Scheme 5 Solid phase synthesis of the Lewisb blood group determinant pentasaccharide glycal. was obtained in a 40% overall yield from 19. Initially, solution chemistry was used to further convert glycal 34b into a hexasaccharide of the Leb system, whereupon 34b was conjugated with human serum albumin to provide the desired neoglyco-protein. These approaches toward the synthesis of blood group determinants on a solid support were hampered by a serious shortcoming in the methodological arsenal of the glycal assembly method. While this strategy permitted rapid and concise access to ¡-glycosidic linkages, solution phase methodology solution had to be used for construction of V-acetylamine glucosidic linkages prevalent in biologically important blood group determinants, gangliosides, and N-linked glycopeptides . To install the appropriate functionality at C2, solution phase chemistry has relied on a trans-diaxial addition of an iodonium electrophile in the presence of an amine to form an iodosulfonamide. Displacement of iodine proceeds presumably through an aziridine intermediate and may be induced by a thiolate nucleophile to fashion thioethyl 2-amidoglycosyl donors . Successful transfer of this method to the solid support allowed polymer-bound glycals to be converted into thioethyl gly-cosyl donors. These donors were in turn coupled with a variety of glycosyl acceptors, including glycals . After an efficient coupling protocol for the synthesis of ¡-2-amidoglucosidic linkages had been established, the difficulties encountered during the earlier synthesis of the Lewisb pentasaccharide glycal could be overcome. Branched tetrasaccharide 22a was converted into the thioethyl donor 23. Coupling to galactal acceptor 24 yielded 71% of the desired pentasaccharide 25a (Scheme 5). TBAF was used to effect retrieval of the pentasaccharide, affording 25b in 20% overall yield from 19 . While the use of glycals on the solid support allowed for the construction of galactosyl linkages with great efficiency even with hindered glycosyl acceptors, the analogous ¡-glucosidic linkages could not be prepared reliably. In the galactose series, the anhydride is relatively stable to very mild Lewis acids, particularly anhydrous zinc chloride, because a conformationally constraining cyclic carbonate protecting group is used. The stability allows for galactosylation of even hindered acceptors such as C4 hydroxyls flanked by protecting groups at C3 and C6. No analogous constrained glucosyl epoxy donor is available, and glucosyl systems in the presence of zinc chloride are highly reactive and thus are prone to donor deterioration. To overcome the problems associated with the formation of ¡-glucosidic linkages, an approach that allowed for the conversion of glycals into thioethyl glycosyl donors was developed in solution phase . These thioethyl glycosyl donors constitute a class of extremely powerful glycosylating agents upon activation with thio-philic reagents . The glycal-derived donors were equipped with a C2 pivaloyl neighboring group and coupled to glycal acceptors to fashion a variety of glycosidic linkages with high efficiency. Pivaloyl neighboring groups had been shown by Kunz and others to prevent the formation of orthoester products during glycosylations . Conversion of 26 to the protected thioethyl glycosyl donors 27 was achieved through epoxidation with dimethyldioxirane to yield the 1,2-anhydro sugar, followed by opening of this intermediate by ethanethiol in the presence of a trace of acid. Thioethyl glycoside 27 was obtained in 91% yield and transformed into fully protected thioethyl donor 28a by pivaloylation in near quantitative yield. 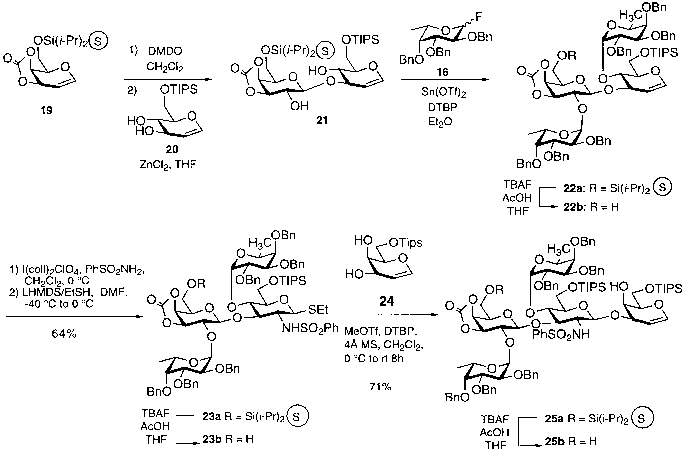 Support-bound thioglycoside 28a was activated using methyl triflate as a thiophile, while the non-nucleophilic base di-ferf-butylpyridine (DTBP) provided stability for the glycal linkage during coupling. In model studies the formation of ^-glucosyl (1^4), ^-glucosyl (1^3), and ^-glucosyl (1^6) linked disaccharides was achieved in good yield and complete selectivity . After an efficient coupling protocol involving support-bound thioethyl glucosyl donors had been established, this methodology was applied to the synthesis of tetra-saccharide 31 containing exclusively 0-(1^4) glucosidic linkages. Transformation of disaccharide glycal 29a into the C2 pivaloyl thioethyl glycosyl donor was followed by coupling to provide trisaccharide 30a in 45% overall yield from 26. Conversion of 30a to the thioethyl glycosyl donor was followed by coupling to glycal acceptor 14 to yield the desired tetrasaccharide 31a. After cleavage from the support 31b was obtained from 26 in 20% yield over nine steps, corresponding to 84% average yield per step (Scheme 6).